Red Teaming is can be described as a type of wargaming.In private business, penetration testers audit and test organization security, often in a secretive setting. The entire point of the Red Team is to see how weak or otherwise the organization’s security posture is. This course is particularly suited to CISO’s and CTO’s that need to learn how to build a successful Red Team, as well as budding cyber security professionals who would like to learn more about the world of information security. 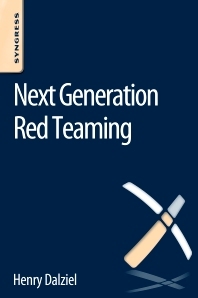 Shows how to build a Red Team and how to identify different operational threat environments.